We had already finished the first para of kaliyan aruL pAdu here. 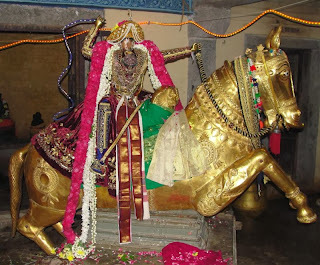 As time passed and all the eleven AzhwArs had attained paramapadham the birth of the twelfth AzhwAr was to take place and the AzhwAr was thirumangaiAzhwar, born on the auspicious day of krithikka nakshatram on the month of kArthigai, after a long gap. We had already seen how he was initially interested in worldly pleasures and how he was reformed towards bhagavad vishayam in the intro. More can be read at http://guruparamparai.wordpress.com/2013/01/23/thirumangai-azhwar/. sarvEchvaran vibUthiyadaiya ivar thodaikkIzhE kidakkiRadhO ! One would think that the sarvEsvaran's wealth is under AzhwAr's control while seeing his parAkramam and strength. AzhwAr’s name emphasizes this. parakAlan – ‘ lord of death, yama, for his enemies. ’ Even vayalAli manavAlan named him as kaliyan, one with great strength. emperumAn used this strength to make AzhwAr sing maximum divyadesams. AzhwAr was having immeasurable ahangkAram because of dhhAtmAbimAnam. We had already seen this in the introduction. AzhwAr was having dhEhAtmAbimAnam and thus was not fit Atma gnyAnam or Iswara gnyAnam. dhEhAtmAbimAnam is the main enemy for jIvAtmAs like us. It makes us attracted to vishayAntharams. This was the case of AzhwAr until he got the thirumanthram from vayalAli manavAlan.